Axe Climber is an exciting game. 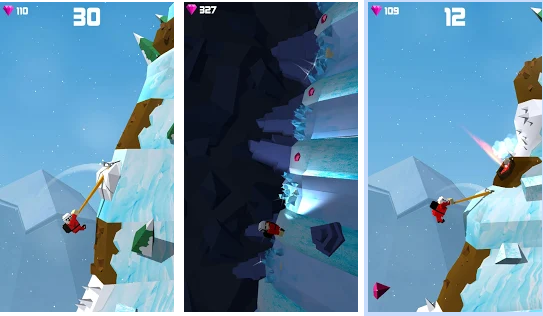 You wear climber shoes to reach the highest mountain peak.Car playing Axe Climber is very simple because all you have to do is tap the screen to stick to the pickaxe. The longer you press, the farther the distance the rope will be. After you master this technique, climb while overcoming the obstacles that appear along the way. Stalagmites that form on a mountain are a major challenge when climbing, not to mention you have to calculate the jump distance carefully if you don't want to start again from the beginning. The Axe Climber's main goal is to climb as high as possible. Every meter you ride adds points. So, if you want a lot of value, jump over a large gap and avoid all obstacles scattered above and below the mountain slope. Along the way, collect hidden diamonds that give rise to other climbers to accompany you along the way.